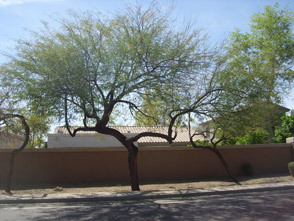 Sometimes-deciduous spreading tree grows quickly to 25' high/wide. Graceful dark green leaves measure up to 12". Handsome trunk dark brown, branches thorn-less. Needs infrequent deep watering. Drought tolerant.